Never shop hopped? Well, get ready! This is the mother lode of all road trips! And it’s produced by Nellie’s Barn Sale so it’s sure to be a good time! 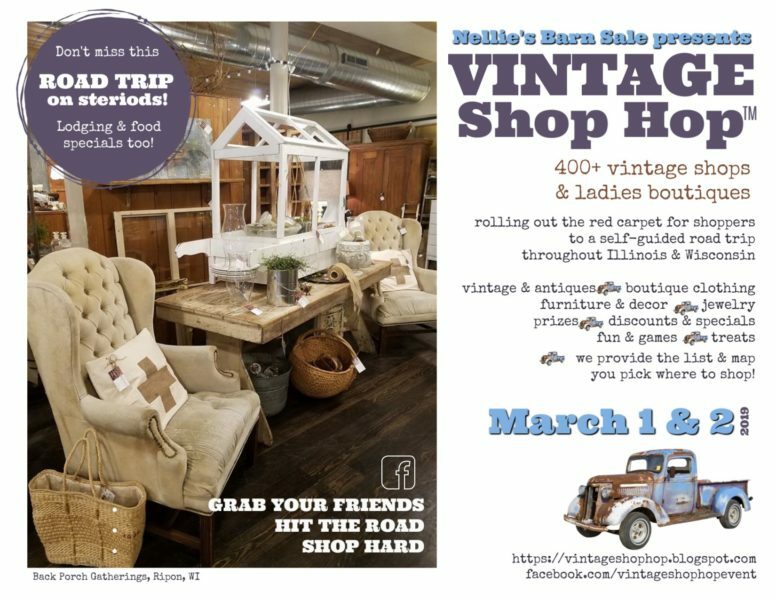 The Vintage Shop Hop is a self-guided day of vintage & boutique shopping. We’re gathering 400+ vintage shops and antique store owners, along with women’s boutiques & home decor shops in northern Illinois and southern Wisconsin to roll out the red carpet for you on March 2 & 3, 2018. You just have to gather your friends and head out! Each shop will offer their own promotion–fun things like discounts, demonstrations, artists on site, prize drawings, treats, wine tastings, entertainment, punch cards, parking lot sales, and more…whatever they want to offer to customers for your shopping enjoyment. You can follow along on this page as we highlight shops each day along with “mini-regions” that encompass many shops in one area. Every few days we post an updated interactive Google Map showing all shop locations. You can pull it up on your mobile device as you shop, making it easy to hop from shop to shop! And because it’s a Google Map, you can also see restaurants, points of interest, gas stations and more! There will also be a “list” of shops that are categorized into mini-regions for easy traveling from one to the next. You can find this list posted every few days…and when it’s complete with all 400 shops, it will be posted to our blog year round. Print it off and keep in your glove compartment!